Inside: Are you a tired and overwhelmed mom? I was, too, and let me tell you, minimalism can help you in more ways than you know. A little over three years ago, I felt like I was drowning. As a mom of three kids from ages five down to one, I was exhausted. I would organize and reorganize our stuff, spending hours getting everything just the way I liked it, only to have my kids come in behind me and wreak havoc on my perfect system. I started to realize after a while that our stuff was negatively affecting my life in a big way, but I wasn’t quite sure what to do about it. I tried organizing – lots and lots of organizing and reorganizing. But while I genuinely enjoyed organizing, I spent way too much time on it. I felt like I was on a hamster wheel, and I couldn’t get off of it, no matter how hard I tried. Then I came across a blog post by Anne at Modern Mrs. Darcy about The Life-Changing Magic of Tidying Up. That post changed my life. I bought the book and finished it in two days. Marie Kondo sold me on the benefits of decluttering and living with less. Turns out we did indeed have that much stuff. We had so much more than I thought we did! I donated bag after bag of toys, clothes, home decorating items, and kitchen items. By the time I was done, I felt lighter. I felt free. I was a happier mom. Since that time, I’ve wrestled through the difficulties of trying to do minimalism on a lower income and minimalism with kids. Both those things can complicate minimalism. But despite the challenges, I still believe that minimalism is worth it. Our lives are significantly better with less. But Is Minimalism with Kids even Possible? Is minimalism even worth trying when you have kids? Is minimalism really realistic? Yes, but only if you stop looking to extreme minimalists for your definition of minimalism. I interact with so many people who scoff at minimalism, rejecting what they think minimalism has to look like. They just can’t see themselves living with two pieces of furniture, white walls, no decorations, and two towels. As a family of six (soon to be seven), I hear you! I don’t want white walls and two pieces of stark furniture. That’s the opposite of cozy or practical in my mind. And even six towels – one per person – just wouldn’t cut it in our family. Neither would one set of dishes per person. If you’ve ever been intimidated by extreme minimalist moms whose homes don’t even look like they have kids, you’re not alone. 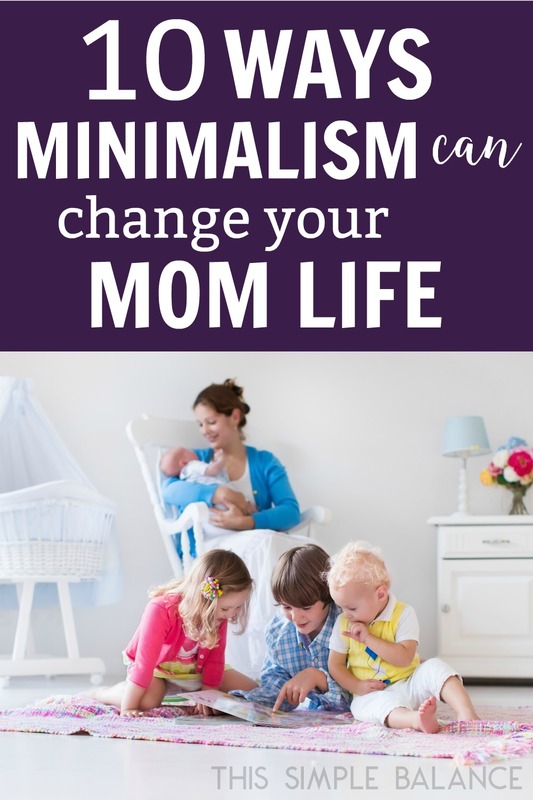 If you’re afraid to call yourself a minimalist because of those moms, you’re not alone there either. But then I decided that I don’t really care what other minimalists think about how our family lives our lives, what we decided to keep and what we choose to buy still. It really doesn’t matter. Minimalism will look different for everyone. What you need will vary depending on your stage of life, family size, and lifestyle. What you love is also obviously very personal. So, stop allowing comparison to hold you back. Minimalism isn’t a competition of how little you can own. It’s mostly about your stuff not owning you or your time. It’s about limiting the stuff you allow to come into your home and asking whether or not an object is valuable enough to you or your family to spend your precious time taking care of it. It’s about freeing your time to live life with your kids, instead of spending that time managing everyone’s stuff. It’s about having time for what matters most. Sounds pretty good, right? Here are all the benefits of minimalism for busy moms, in case you needed more convincing. This one is huge! I don’t know about you, but even as a minimalist mom, I am pretty spent at the end of the day. That could have something to do with being pregnant, having four kids already, homeschooling and working from home. And that’s with MUCH less stuff in our home. I could not be doing everything I’m doing without being a minimalist. I would be beyond exhausted. But these days, my energy is mostly spent doing things I’m passionate about: homeschooling, blogging, spending time with my family. Some of it is spent on cleaning/organizing, but very little. I don’t give my best hours to cleaning. I get to give it to the things that matter most to me. Decision fatigue is very real. We have a limited amount of decision-making power at the beginning of each day, and as moms, it gets used up at a much higher rate than singles or marrieds without kids. How many times do we give our kids whatever they want because we’re just too tired to make one more decision? Minimalism reduces decision fatigue by reducing the number of choices we need to make every day. When we have capsule wardrobes, we don’t waste decision-making energy on getting dressed in the morning. I can’t believe how much time and energy I used to spend on something as simple as getting dressed every day! When we choose to minimalist meal plan, we don’t waste our decision-making energy every single week. Instead, we spent it once, and then we’re done for the most part. When we stop buying stuff all.the.time., we don’t waste our decision-making energy reading reviews for the new fancy kitchen appliance we think we need (because there are ten different models to choose from, and amongst all the five-star reviews, you’re sure to run across a one-star that makes you need to read them all again). We use the tool we have that does the same exact thing – maybe it takes thirty seconds longer, instead. Minimalism allows you to make good decisions about the things that matter most and restores your energy to stand by the decisions you’ve already made. Can I get an “Amen”?! I don’t know a single mom who doesn’t want to clean less. That’s why all those Facebook memes with “Laundry or Dishes, which is your least favorite chore?” are so popular. Less time cleaning makes moms happy. So much of cleaning is clearing the clutter so you can actually clean. That’s partially why some people don’t hire outside help for cleaning because it’s so much work to tidy your house for someone to come clean it that it just doesn’t seem worth it. When you have less stuff, it takes much less time to tidy your house. Fewer toys means that your kids can put them away almost as quickly as you can. Fewer clothes means less laundry for you to do. Less everything equals less time spent tidying, which means the actual cleaning takes far less time. Granted, minimalism needs to be paired with a good cleaning routine. How many “days off” have you spent half-heartedly decluttering and organizing your home? Everyone else in your family is probably resting. My husband and kids don’t really need to be taught what a day off is for. They totally get it. I, on the other hand, have a really hard time doing nothing. Pre-minimalism, I never felt at peace in my own home enough to rest. I needed to clean and organize before I could rest, and by the time I finished, I had to do it all again. What if we spent at least a couple hours as moms on days off actually resting? How would that change us? Taking an entire day off as moms is unrealistic. I know this. But a couple hours? That can be accomplished if we spent less time organizing and tidying (let alone cleaning) and running errands to buy more crap to organize and tidy. 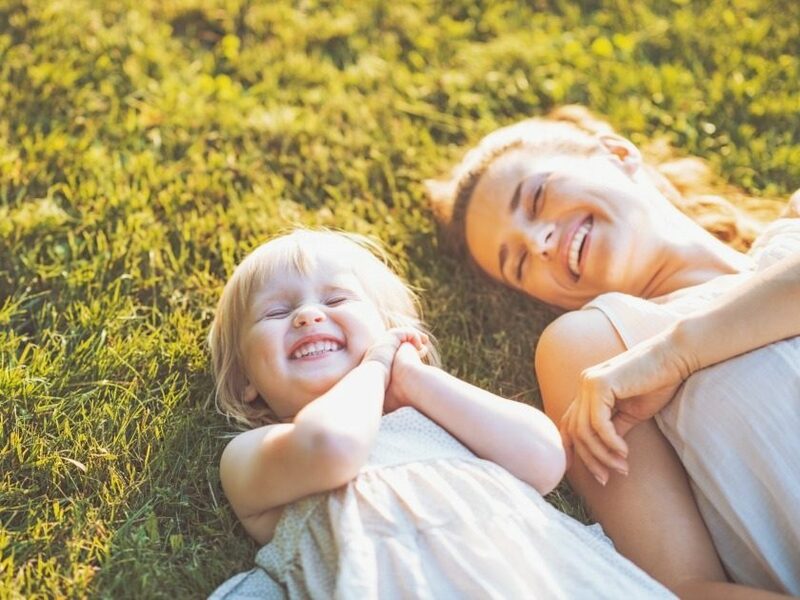 Rested moms are happier moms. It’s amazing how much of our time as moms is spent in the car. Very little of that time is justified, in my opinion. How much time do we waste driving around from point A to point B? Groceries? Yes, we need those, though I wish I could find a way to live without them, sometimes. Another Joanna Gaine’s throw pillow from Target? Not so much. Another toy that warrants one more trip to the mall (that will inevitably lead to unintended purchases)? Definitely not. Do our kids really need two more classes a week to have a happy childhood? No, they don’t. And once you’ve decluttered your possessions, you will naturally want to declutter your schedule as well. Fewer things on the schedule equals happier kids and happier you. Fewer things to buy equals less time and energy spent in the car. Only recently have I started to consider the environmental benefits of minimalism. I’ve never been all that concerned with preserving the earth. That sounds really bad, but I just didn’t care all that much. However, the more I write this blog, I more I read other blogs, and the more other people’s passions started to affect me. The more I read about how our waste affects the earth, the more conscientious I become about what I throw away and what I use day to day. Reducing waste with kids is a challenge, that’s for sure! Baby steps. It started with a paperless kitchen, which to be honest was motivated more by frugal living than achieving zero waste. Paperless towels led me to using fewer and fewer Ziploc bags, which led to buying soap in bulk in order to save money and to stop throwing away plastic containers. It motivated me to drop off our unwanted, but well-worn items off at the thrift store instead of throwing it away. After all, someone else might want it (one man’s trash is another man’s treasure), and if it doesn’t sell, my research showed that many thrift stores have better methods of recycling and disposing of discarded items than I do. The more carefully we consider our purchases, the less likely we are to make a poor buying decision, and the longer we are likely to keep the item. And when that item has lived its life in our homes, minimalists are much more likely to find that item a good next home. Minimalism is just better for the earth, an earth our kids will inherit one day. I’m sure you’ve read by now that clutter causes stress, particularly for women. But what isn’t talked about as often is the stress beyond just the clutter itself. As I’ve already mentioned, when you are in the habit of owning and buying more stuff than you really need, you probably run a lot more errands, whether to buy more stuff or to buy more storage containers for your stuff. For most people, more errands cause more stress. Cluttered schedules are another huge source of stress for moms. When you declutter your schedule, you create margin in your life, which enables you to effectively handle the inevitable stresses of motherhood (not the ones we create with our ridiculously full calendars). Finally, debt is a huge source of stress, one that is often caused by overspending and buying things we just don’t need. Minimalism can reduce your debt if you adopt a minimalist lifestyle long-term. If you don’t allow Marie Kondo’s well-known question, “Does this object bring me joy?” to guide your decluttering, minimalism will end up saving you money. Depending on the quality of your unwanted belongings, you may be able to sell your clutter for a profit (but if your stuff is already worn, you might not). Even after decluttering, your buying habits will change, and you will think through every purchase carefully. After all, once you’ve spent that much time and energy decluttering, you are not going to want to go through that again. Less money spent on stuff equals more money for your big goals: emergency funds, saving for a home, travelling with your kids, college funds. You name it, more money can probably help! I’m pretty sure we all want more memories with our kids. But how much of our time is actually spent making memories with them? Is your time spent cleaning up after their play? Is it spent carting your kids around to various events that are just for them plus friends, instead of for your whole family? Minimalism means less stuff to manage and fewer unnecessary activities on the calendar. It means you can make memories as a family, instead of giving away those memories to ballet teachers or camp counselors or even youth pastors. We often clutter our schedules with extra activities to get a break from our kids because we are so tired from managing unnecessary clutter that we miss out. Minimalism offers you the chance not to miss out. 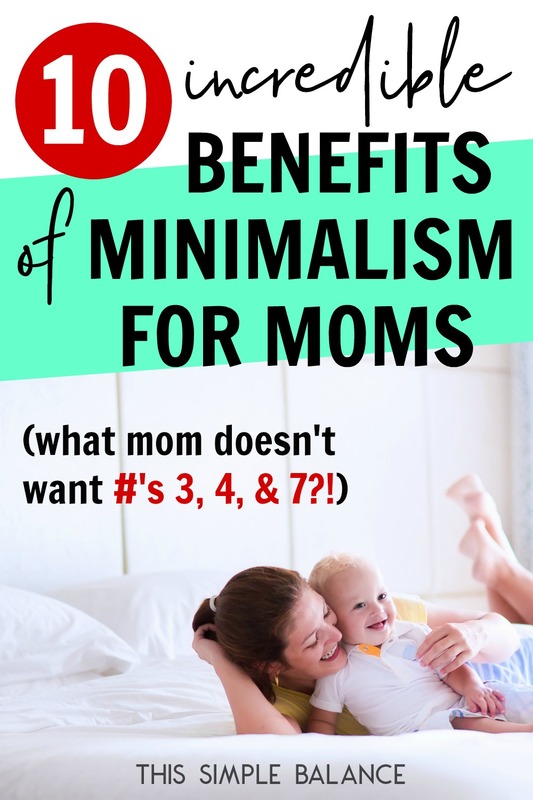 This is a little redundant, I know, but I’m going to say it again, if briefly, because I believe it is the biggest benefit of minimalism for moms. Minimalism gives you back your time, not just for your family, but for you, too. Without minimalism, I would not have had the time to start a blog, a blog that now contributes extra income to our family’s otherwise one-income budget. Without minimalism, I wouldn’t have time to homeschool my kids and spend nearly every waking minute with them. Minimalism gives the gift of time, and hopefully the space to figure out how you want to spend it. Ready to Become a Minimalist Mom? I’m not going to lie to you: minimalism takes hard work up front. Decluttering is far from easy. However, after you get through the first big round (yes, you’ll probably go through multiple rounds of decluttering because kids are stuff magnets in so many ways), you will start to see the benefits of minimalism. I truly believe that minimalism will change your motherhood.